The Hydro Blasters competitive based game will keep kids entertained and excited! The game is played by crouching underneath the balloon chamber while you rush to pump air and allow water to simultaneously fill the balloon that hangs above your opponents head and pop it before they beat you to it. 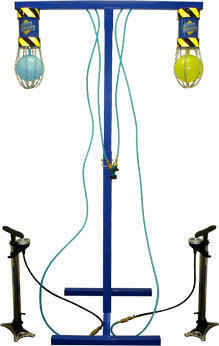 The Hydro Blaster is the new movement to the dunk tank experience without all the mass water usage and dumping. This game is something schools and other public recreational areas can finally use to substitute for the dunk tank because of its safe and irrigation friendly nature. Requires an adequate water source within 50 feet of game. Includes 25 5" Balloons. Additional Balloons can be purchased seperately.